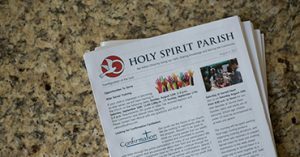 Holy Spirit Parish is a vibrant Catholic Christian community that is inspired by the spirit of faith, hope and love. We are blessed with generous, talented people with minds that believe, hearts that hope, and souls that love. We encourage you to share in the Spirit. Our website will give you a brief introduction to our community. We would love to get to know you better and share our faith with you so that we can bring the message of Christ Jesus to more in our wider community. 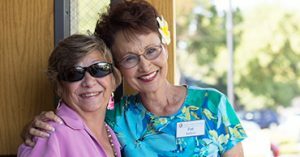 Contact us at 408-997-5101 and we can connect you with a member of our welcoming committee to answer any questions you may have. Below are some links you might find helpful. If you are ready to join our community, let’s make it official! Register today and a member of our welcoming committee will contact you soon! Please don’t hesitate to contact us if you have any questions. Wearing name badges to Mass and events is a wonderful way to make friends faster and get to know each other better. Click below to order your name badge(s) and don’t forget to wear them to Mass and parish events! Get Fr. Brendan’s homily emailed directly to your inbox. Get our Community Update to stay in the loop with announcements and parish events. Get connected, stay connected! What time is Mass? Do you offer Mass in Spanish? We celebrate five Masses at Holy Spirit: Saturday at 5:00 p.m., and Sunday at 8:00, 9:30, 11:30 a.m. and 6:00 p.m. We only have English-speaking Masses at this time. 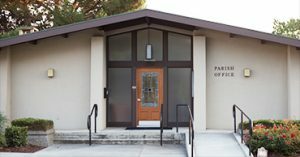 Our Parish Office is open Monday through Thursday* from 8:30 a.m. to 4:30 p.m. and Sunday 9:00 a.m. to 1:00 p.m. We are closed Friday and Saturday. * We are usually out to lunch on Thursday’s from Noon to 1:00 p.m.
How do I get information about __________? Click here for a list of our various ministries. Each link will direct you to more information and a contact person. If you don’t see what you are looking for, please call us at 408-997-5101. How do I contact __________? Click here to view our directory which lists our various ministries and contact persons. If you don’t see what you are looking for, please call us at 408-997-5101. How can I volunteer to serve? Click here for a list of our current Opportunities to Serve. There you can also fill out our interest form if you need help finding a ministry that’s right for you! Click here for easy and convenient options to give online. Can I submit an announcement for the bulletin? Please contact Shirlene Do at 408-997-5109 or sido@dsj.org. All requests must be approved by our Pastoral Team. Can I reserve a room for an event? We have an extremely active parish which makes our facilities busy and full. At this time we only reserve rooms for parish and school events. Do you offer assistance with rent and/or bills? We do not have a program for rent/bill assistance. Please click here for information and referral services in the Bay Area.